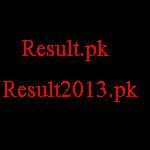 Bahawalpur Board PEC 5th Class Result for year 2013 has been announced. According to news by Punjab Examination Commissions, 5th Class Result 2013 for Bahawalpur District has been announced. Previously, result scheduled to announce on 31st March 2013, but due to sunday holiday PEC announce result day before on 30th March 2012. Bahawalpur Board fifth class students are able to see their 5th Class Annual Result 2013 online at www.result2012.pk and www.result2013.pk.